The Bissell Spotbot has gained attention over the years as a portable deep carpet cleaner that can remove the most awful unwanted stains. The Bissell Spotbot Pet has been a huge convenience for pet owners, who can set the Spotbot over the stain and walk away, returning to a clean and sanitized floor. The Spotbot has gone through several model iterations, including previous models like the Spotbot 78R5, 1200A, 1200B and 12U9. But the most recent model Bissell simply calls the Spotbot Pet, and it is the culmination of their years of development on this handy spot stain cleaner line. The huge advantage of the Spotbot is that you can just set it on the stain, turn it on, and walk away. That’s it. The Spotbot does all the cleaning work on its own, while you go about your business as usual. When you returned the stain should be removed and the spot sanitized. It’s a huge benefit for pet owners, many of whom are very familiar with having many spot stains to clean up on a regular basis. This page contains multiple Bissell Spotbot reviews for the various older models, but our focus is on Bissell Spotbot Pet reviews at the start. 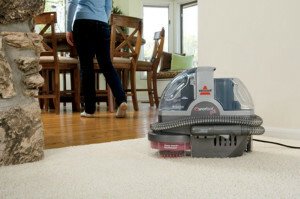 The Bissell Spotbot is a hands-free cleaning or manual cleaning deep cleaner that has a unique spiral brushing capability and features a process that sprays, suctions clean and then dries the carpet in one step. All models are capable of removing stubborn stains and dirt and reaching the hard-to-reach areas because of their compact size. 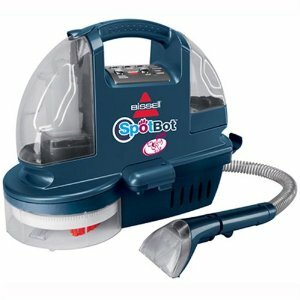 Here we’ll review the various models, but focus first on the newest model, the Bissell Spotbot Pet. The Bissell Spotbot Pet was designed to be the very definition of convenience for pet owners or anyone else with the need to clean up isolated spot stains on a regular basis. It comes with several preset settings for lifting various types of stains (such as surface stains, or deep set stains) and you simply place the Spotbot on the stain, choose your setting and walk away. The length of the cleaning cycles vary, but are around 5 minutes. The Spotbot doesn’t move around like a Roomba or anything; it stays in one place scrubbing your stain with its deep-reach spiral brushing system and carpet cleaning formula , giving you a truly hands-free cleaning experience. When you return, the mess is gone and the bacteria and odors are sanitized. 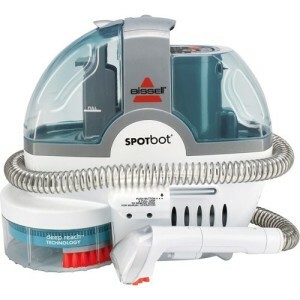 Of course you can also use the Spotbot Pet as a handheld spot cleaner, using its hose and cleaning brush attachment to clean stairs, upholstery, car interiors, and any other tight areas. It’s designed to work on virtually any type of carpet, but as usual you should follow the directions from your carpet’s manufacturer if your carpet is extremely sensitive to detergents or brushes. Customers overall have raved about the Spotbot Pet. It gets strong customer reviews, on average over 4 stars, and many consumers really appreciate how well it does at lifting stains as well as saving them time. Not to mention giving them the ability to not have to deal with the real messes from their pets or young children. Just leave it to the Spotbot! View full customer reviews and prices for the Bissell Spotbot Pet on Amazon. The other updated model of the Spotbot is the 78R5 model, which you’ll notice looks very similar to the Pet in its more modern look when compared to the older Spotbots below. 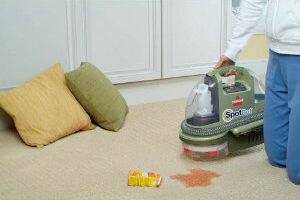 It also has Bissell’s WalkAway technology, meaning you can set this Spotbot in one place and return to a clean carpet. It is essentially the Spotbot Pet without the pet focus. The only difference is the Spotbot Pet comes with antimicrobial cleaners that can do a better job at cleaning up the worst pet messes, and limiting bacterial growth which can help discourage your pet from using the same area again. The prices are virtually the same, so it pretty much comes down to whether or not you have pet stains and a preference on colors. The Spotbot 78R5 comes in a beautiful white color with blue encased plastic. It has a great modern look to go along with its 15 ounce water tank and 3 amps of power. It is designed to lift the water up out of your carpet as well, so it will not be very wet when the cleaning is complete. See full customer reviews and prices of the Spotbot 78R5 on Amazon. Also known as the older Spotbot Pet Cleaner, it is designed to be a deep cleaner capable of cleaning carpet, upholstery or stairs and weighs 19 pounds, making it portable but heavier than the newer models. You can choose to take advantage of the hands-free cleaning or the manual cleaning options and the SpotBot 1200A offers Microban Protection. 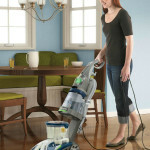 It features a 16 foot power cord and comes with the 3″ stain tool that makes cleaning up small messes easy to do quickly. It is perfect for those that have pets and kids to clean up after, getting rid of stains or spilled soda in as little as 3 minutes. It’s compact and easy to store, with an easy to fill water holding tank. You could expect to find these machines around $130 and they come with a 1 year warranty. The Bissell Spotbot 12U9 is also known as the SpotBot ProHeat Deep Cleaner because it heats the tap water 25 degrees hotter than most of the other models with its built-in heater, like other Bissell carpet cleaners from the ProHeat series. This gives you a steam cleaner capable of cleaning small messes, allowing you easy portability with 18 pounds of weight and a 16 foot cord. You also get the options of hands-free or manual cleaning and it features the unique spiral brushing for scrubbing action. It can get the really tough stains out, which can be helpful for those that have pets because you can just set it down and let it go to work. You get an extra boost of steam cleaning, without needing to drag out the big machine or call in a commercial carpet cleaner. You can expect to find the SpotBot 12U9 for around $150 and it comes with the Bissell 1 year warranty, as well. 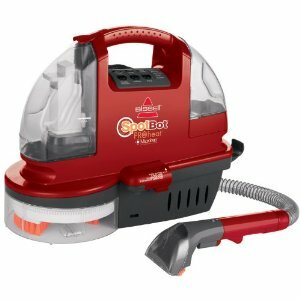 The Bissell Spotbot 1200B, also known as the SpotBot Deep Cleaner, includes the hands-free and manual cleaning options, the unique spiral brushing system and an automatic start system, in addition to the 16 foot power cord and 1 year warranty found on the other models. It is slightly more affordable than the other models, with a price of around $120. It still deep cleans like larger models, but it doesn’t have the built-in heater. It has a hose option, which allows it to function as a wet-vac, which is helpful for those spills on the kitchen tile. 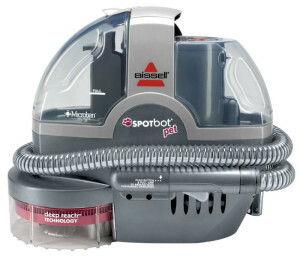 All models of Bissell Spotbot offer deep cleaning in easy portability and they are great for those that have pets. Some people might say their price is close to what you can find some of the cheaper full-sized carpet shampooers, but you have to consider the effort involved in dragging those out each time your pet or child has an accident. The main selling point of the Bissell Spotbot Pet and other Spotbot models is that they provide a quick and easy way to get the stains out before they have a chance to set into your carpet, without much work for you. For that purpose, the Bissell Spotbot cleaners are perfect and can save a lot of effort and money, in the long run. We hope you’ve enjoyed these Bissell Spotbot reviews.